The avalanche hazard is HIGH today. Large natural avalanches continue to occur in the forecast area. Unsupportable snow in the lower elevations is currently making travel very difficult. Warm temperatures and rain in the higher elevations warrant avoidance of avalanche terrain. Given the potential (very large) size of avalanches, the hazard will remain elevated throughout the day. Travel in or under avalanche terrain is not recommended today. Due to the recent extended period of rain and warm temperatures, the motorized areas around Turnagain Pass are closed until further notice. Please check the Chugach National Forest website for the official statement. We will provide updates at the bottom of this page as conditions change. The West face of Pyramid slid sometime yesterday afternoon. This avalanche ran full path, approximately 3,000’ and took out what appears to be weak snow near the ground and the entire snowpack above it. With over an inch of water that has fallen in the past 24 hours coupled with another .4” forecasted for today, expect very large natural avalanches like this to remain a possibility. Avoidance is the only way around this avalanche problem for now. As temperatures cool and precipitation diminishes over the weekend expect the likelihood of wet slab and wet loose avalanches to go down. Up to 2,500' in elevation the snowpack was isothermal yesterday. Temperatures overnight have remained elevated. In addition to large wet slabs, expect wet loose avalanches in steeper terrain. Avoid being in the runout of larger paths if you happen to find yourself in the lower elevations today. Above treeline the snowpack has been growing over the past week. While our time on or near ridge lines has been limited of late, we know that rain in the lower elevations has equated to heavy snow above 3,000’. The general snowpack structure is poor in the higher elevations, with weak snow sitting at the base. Slabs up to 6’ in depth have the potential to release, take out entire slopes and run far. As freezing levels climb and more precipitation falls today, the likelihood of deep unsurvivable slabs releasing will go up. Yesterday my partners and I were able to get a look up at several ridge lines. Cornices have grown exponentially over the past week. Similar to Deep Slabs and Wet Avalanches, cornices have the potential to drop onto slopes and trigger very large unsurvivable avalanches. Avoid being in the runout of large avalanche paths today, especially those with large cornices looming above starting zones. Yesterday brought a seventh day of warm and wet conditions. 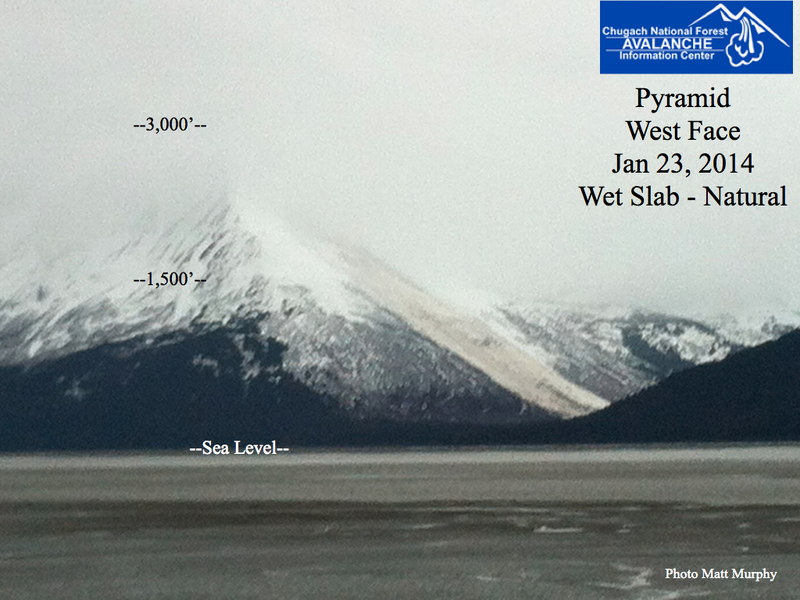 Another ~1.3” of water in the form of rain fell in the Girdwood Valley. Freezing levels climbed as high as 3,800’. Today expect another day of similar weather. Up to an additional .4” of water will fall, winds will be out of the East at 25-35 mph with higher gusts. Freezing level with climb as high as 4,000’ today. Tomorrow will bring the first break in the wet weather. Skies will clear with valley fog developing. Temperatures will remain mild. The extended outlook points to a potential high pressure blocking pattern developing by the middle of next week. Pray for snow!